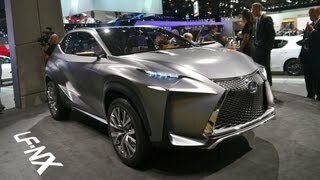 Lexus has unveiled the LF-NX Turbo Concept, compact premium crossover concept, at the 2013 Tokyo Motor Show. On the exterior the Lexus spindle grille has gained a smoked chrome trim, there is a black mesh lower air intake above a matt chrome chin spoiler, upper rocker panel in matt chrome, a new lower bumper in matt chrome finish, chrome exhausts, wheel arches and lower rocker panel with high-gloss black paint finish and stronger alloy wheel design. In the cabin the performance potential is expressed in the red illumination for principal controls, meters, navigation screen and Remote Touch Interface, touch tracer and touchpad controls. 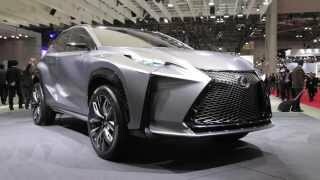 The LF-NX Turbo concept is equipped with Lexus’s 2.0-litre, four-cylinder turbocharged petrol engine. It features Lexus’s advanced high-tumble port, fan spray fuel injection, D-4S and VVT-i combustion technologies. The unit is engineered for fast throttle response, yet demonstrates excellent fuel economy.